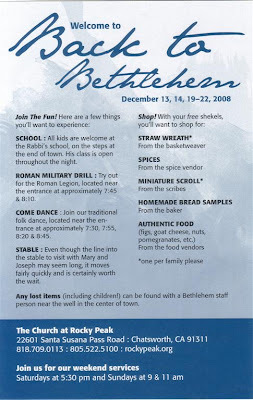 A little Christmas gem in northwest corner of Los Angeles is the "Back to Bethlehem" event. It's held every year on the two weekends before Christmas in Chatsworth, in the San Fernando Valley, at the Church at Rocky Peak www.rockypeak.org. This is definitely worth seeing - and experiencing! 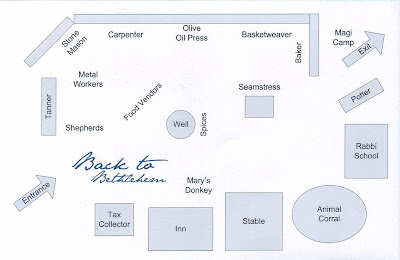 This map gives an idea of the many things to see and do. The night we went, the event seemed well attended, but never felt overly crowded. Definitely something we'd like to see and do again. Thanks for the good word. I am one of the shepherds at the entrance to Bethlehem. It is a blast to share the Good News!!! This is an awesome event. An annual tradition for my family. Don't be intimidated by the amount of people, you will be able to see and experience everything. Wait in line to see Jesus, the lines moves fast and it is definately worth it. Thank you Rocky Peak for keeping us grounded to the true meaning of Christmas!